I thought I would start the year in style with a slightly unexpected location for a sweet treat. Duck and Waffle, for those who have not heard of it already, is a restaurant on the 40th floor of the Heron Tower, just above Sushi Samba. It is mostly known for its undisputed views of London, for being open 24 hours a day all year round, and for offering 3 variations of their glorious menu, appropriately adapted for the time of day. Executive Chef, Daniel Doherty, has done an incredible job at making sure that every little dish surprises you and keeps you salivating for more. Before I start on the desserts and reminisce on the sweet delights made in this sky high, heavenly kitchen, I have to mention their signature dish – the Duck and Waffle. This alone satisfied my sweet tooth. The dish comprises of a succulent confit duck leg, a fried duck egg, a fluffy, sweet waffle, and spiced maple syrup that you pour all over the dish. Initially it sounds like a very unusual pairing, but trust me, it is mouth-wateringly delicious. The savoury element of the duck compliments the sweetness of the waffle and syrup extremely well, and when you cut into the runny yolk of the duck egg, the dish becomes complete.I would defy any sweet lover to say that this dish is not sweet enough to satisfy their cravings. Now, on to the dessert menu. This was a real highlight of the meal and was appropriately named “The Full Elvis”. Just in case the waffle in the duck and waffle dish wasn’t enough, this is another opportunity to try out those light, fluffy cushions of heaven again! The Full Elvis is made up of two waffles, summer berries, peanut butter and ‘jelly’ (jam as it is known to most of us), caramelised bananas, chantilly cream and is finished off with a sprinkle of chocolate crumbs. This can either be seen as a very generous portion for one, as my boyfriend chose, or it can be shared between 2 as the menu suggests. 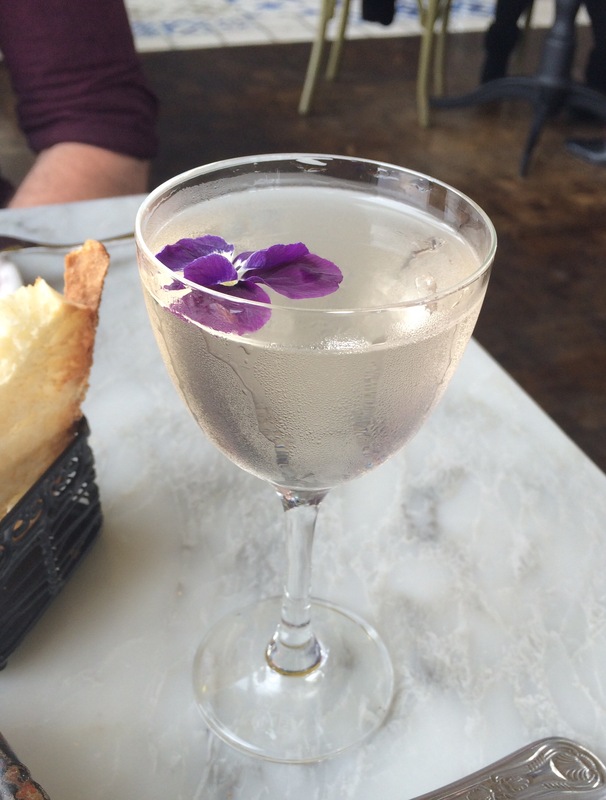 All these culinary delights can be washed down with an array of cocktails including this delightful little gem, the violet martin – almost too pretty to drink but do not be deceived by its size, it very potent! All in all, this is definitely somewhere that anyone visiting London has to go! It is a little pricey, so I would keep it for a special occasion or as a treat, but remember, you can go any time of the day and can skip straight to dessert. Try it out for yourself, you will not be disappointed!